Many stroke survivors will tell you that becoming knowledgeable about stroke is an important part of recovery. The better you understand your stroke, the more active you can be in your post-stroke care. Remember, no one has a greater interest in your well-being than you! Below is a list of questions you can use to speak with your healthcare provider about your (or a loved one’s) stroke. 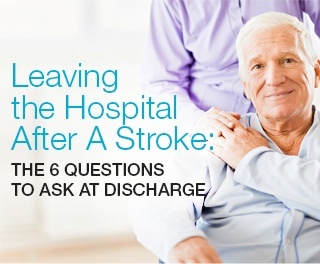 Whether you had your stroke after a medical procedure or you had it while playing a game of golf, it’s important to ask your healthcare team what caused the stroke. Your healthcare team will be able to give you more information by determining what type of stroke you had. There are three types of strokes: ischemic stroke (caused by blood clots), hemorrhagic stroke (caused by ruptured blood vessels that cause brain bleeding), or a transient ischemic attack (TIA) (a “mini-stroke,” caused by a temporary blood clot). Start by finding out which one you had. ACLS Medical Training has published a "Stroke Scale," created by the National Institutes of Health (NIH), that may help assess the level or severity of a stroke. 2. Do I have aphasia? Many stroke survivors experience a loss of language for a period of time after a stroke. Some report a loss that lasts a few days; others have significant loss and cannot read, write, or speak for a prolonged period of time. This is a condition called aphasia. As many as 40 percent of stroke survivors will acquire it. Check with your physician and speech-language pathologist to the extent of your language loss and how you can manage your aphasia. A caregiver or loved one may need to help if you have difficulty speaking. After your initial hospital stay, you will follow up with a number of physicians and specialists. Ask your medical team if you should be working on your walking, talking, or daily living skills. Also, ask about additional online resources that may provide helpful tips or tricks for managing your post-stroke care. 4. What type of therapy do I need? Depending on the severity of the stroke and the type of rehabilitation unit you are in, you might need assistance walking, talking, or speaking. A specific type of therapist is needed to help you with each of these tasks. If you experience mobility issues, you will need a physical therapist. If have a challenging time communicating, swallowing, or speaking, you will need a speech therapist. If you need help with daily living, an occupational therapist will be helpful. Work with your physician to create a plan that fits your needs. 5. How can I reduce my risk of another stroke? Survivors who have had one stroke are at high risk of having another one if the treatment recommendations are not followed. Make sure you eat a healthy diet, exercise (taking walks is great exercise), take medication as prescribed, and have regular visits with your physician. Remember, every stroke survivor is different, but connecting with other stroke survivors in an engaging and encouraging environment can provide much-needed emotional support. In support groups you will find others who’ve faced similar health challenges. 6. What role does my family play in my recovery? Caregivers, loved ones, and close friends can provide much-needed support during your stroke recovery. Whether they are helping prepare meals or driving you to and from doctor’s appointments, it’s important to keep a single point person who has access to your medical files and knows how to reach your medical team. Caregivers should also keep an eye out for dizziness, stumbling, difficulty walking or moving around in daily life, inability to walk six minutes without stopping to rest because these could be signs of slowed recovery or another stroke. Finally, remember recovery depends on many different factors: where in the brain the stroke occurred, how much of the brain was affected, your motivation, caregiver support, the quantity and quality of rehabilitation, and how healthy you were before your stroke. Because every stroke and stroke survivor are unique, avoid comparisons. Need more resources? Download our FREE caregiving for stroke survivors eBook.